We are pleased to announce the endorsement of BoardBook® by the Association of Alaska School Boards. With this endorsement, BoardBook is now available to Alaska school districts statewide! Responses from the more than 1000 organizations in 24 states and Canada already using BoardBook have been extremely enthusiastic, and we genuinely believe Alaska school districts will quickly recognize the benefits as well. BoardBook is an electronic agenda-preparation tool accessed through your Web browser that streamlines the compiling, distributing, and publishing of agenda packets. 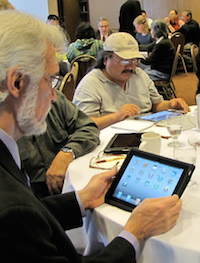 This service enables districts to transition into a paperless meeting format. Not only does BoardBook reduce the cost and frustration associated with meeting preparation, it also generates an online searchable archive of meeting agendas, documents, and minutes. AASB can schedule free webinars to provide an online demonstration of BoardBook. Call 463-1660 for more information. You may also visit BoardBook.org to learn more about system requirements, read testimonials, and view demos of the application. Join us for a 30-minute informational webinar. Learn how to Cut Meeting Preparation Time in Half, Improve Workflow Efficiencies, Automate and Manage Public Postings, and more! See the AASB Boardbook flyer here.